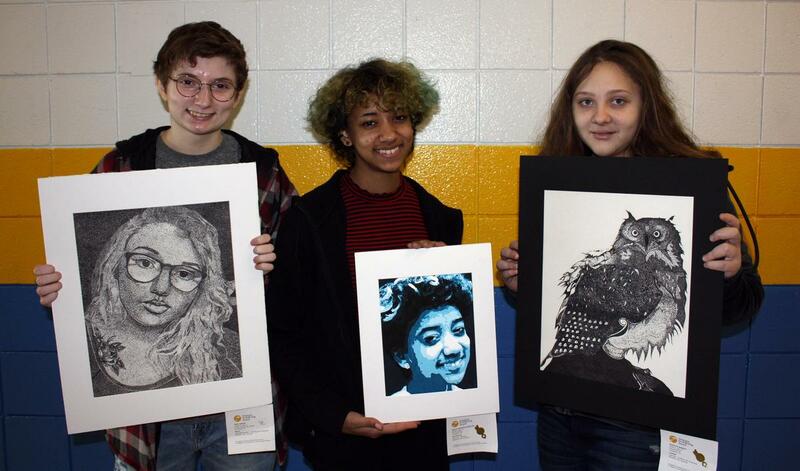 Congratulations to Nick Czepiel, Alexis Peterson, Sharlyn Barrett, and Malia McShane Langston for being selected to share their works of art at the Scholastics Art and Writing Exhibition for the Pittsburgh Arts Region. Over 1,700 works of arts were submitted from Allegheny and Butler Counties. Both Sharlyn and Malia received the Gold Key award for artwork that they had created over the past two school years. The Gold Key award is the highest award that can be given to a work of art in the Scholastics competition. Their pieces will automatically be submitted for consideration for the National Medalists award in early March. Nick Czepiel and Alexis Peterson received Honorable Mentions for their pieces of artwork.